Manchester Symphony Orchestra announces its 75th season and the launch of a $75,000 fundraising campaign. At the baton of Scott Humphries, the orchestra promises something special every concert. 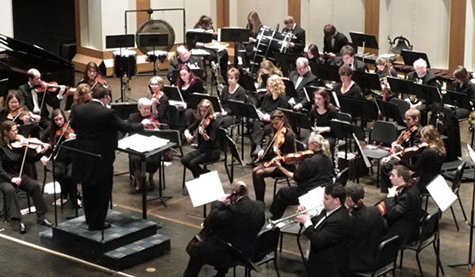 All MSO concerts start at 3 p.m. in Cordier Auditorium on the North Manchester campus of Manchester University, except the April concert, which is at Honeywell Center in Wabash. Tickets are $10; free for MU students with ID and guests 18 and under. The program for the “Diamond Jubilee Concert” on Sunday, Oct. 27 includes audience favorites voted on last season. During the concert, Jeff Diesburg, MU assistant professor of art, will create a mural while the orchestra performs The Symphonic Tale of Peter Pan. For the Holiday Pops concert on Sunday, Dec. 8, the world-renowned Boston Brass will perform alongside the MSO for a one-of-a kind holiday treat. The annual Honeywell Center concert on Sunday, April 6 is a spectacular tribute to area musicians of all ages. Vocal Impact, a Wabash County children’s choir will join the MSO to perform original music written especially for the pairing by Tim Reed, MU assistant professor of music. The Manchester Symphony Chorus will debut for this concert, joining area high school choirs and the MU A Cappella Choir for Mozart’s Requiem. The MSO will collaborate with the University in The Mikado by Gilbert and Sullivan to conclude the season May 2-4 with theatrical humor. Plans for the money are straight-forward – youth! With the $75,000 raised, the Manchester Symphony Society will bring more music education into all Wabash County schools, said Robbie Bucher, president of the Board of Directors of the Manchester Symphony Society. The MSO has a number of plans to enrich Wabash County schools with music education, Bucher said. “Bringing musicians into the schools to expose the children to symphonic music, or hiring an outside organization such as Tales and Scales are two examples,” he said. Tales and Scales educational programs are designed with the premise that "every person is inherently musical and creative, and that the arts are essential to learning.” Opening doors for children in music and the arts has proven to help them lead a more balanced life, say program directors. The other project for the $75,000 campaign is to assist in creation of a Manchester Youth Symphony Orchestra of talented young children through teenagers. "This program is in its opening stages and need many dedicated people to help make it happen," said Bucher. "We need the community's help to get this off the ground, and it starts with raising the money." The MSO has revitalized the Symphony memberships, allowing new benefits for everyone, regardless of membership level. A Corporate Partners package enables businesses to partner with the MSO while promoting their business. The fund drive and its projects begin with the financial support from the community. To get involved by helping other ways, visit the MSO website to learn more and connect with a Manchester Symphony Society board member: www.manchestersymphonyorchestra.com.